Ribbon style hard candy packaged to look like a miniature Ant Farm! Available in Apple and Cherry flavors! Four Wafers of delectable white chocolate flavored swirled with genuine ants and milk chocolate flavored packaged in a window box with REAL Black Ants. Fruit flavored Suckers with REAL Black Ants! Available in Apple, Banana, Blueberry and Watermelon flavors! Real chocolate flavored crickets & larva dipped! 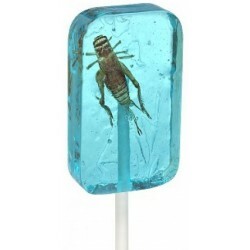 Fruit flavored Lollipop with REAL Cricket inside! Available in Blueberry, Grape, Orange and Strawberry flavors! InsectNside Brittle – a ribbon style toffee flavored candy with insects & fern trapped inside with the appearance of fossilized amber! InsectNside™ Brittle – a ribbon style toffee flavored candy with insects & fern trapped inside with the appearance of fossilized amber! 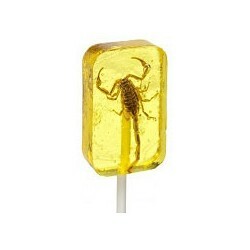 Flavored Lollipop with REAL Scorpion inside! Available in Apple, Banana, Blueberry, Orange, and Strawberry flavors! 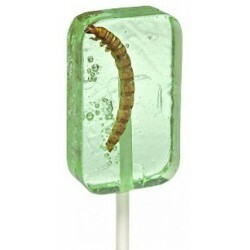 Flavored Lollipop with REAL Worm inside! Available in Apple, Blueberry, Orange, Watermelon, and Tequila flavors!